My first thought for these heals would be a seaside spot, however after a very busy week I didn't want to go too far as I had a trip planned to Italy early Sunday am. My sister was my photographer for the day and she reminded me of a fish stall not to far from us that is friends with our dad so we shot a few of these photos by his stall. Having found the perfect summer wedges my hunt was now for a denim dress, I found a nice fitted pale denim one in Levis but at £90 my main budget went on the heals therefore I had to compromise and find a more reasonable version. 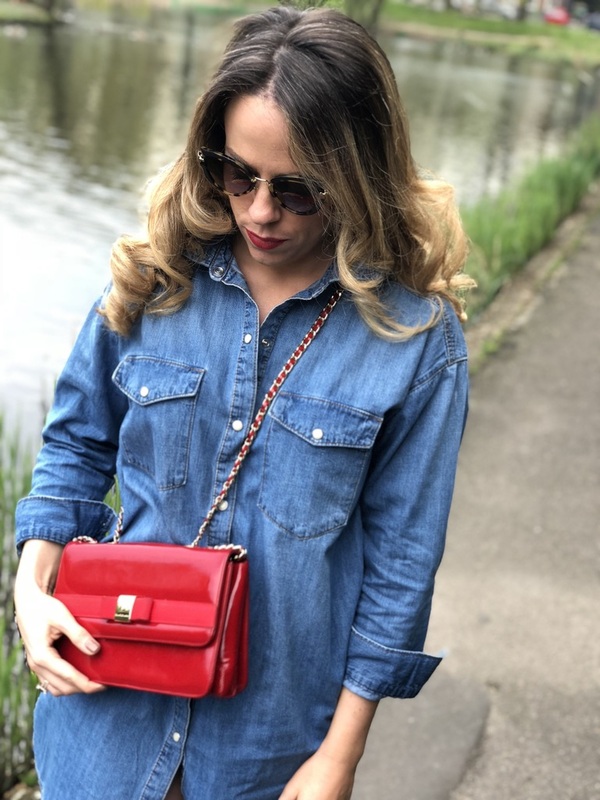 Which is where I found this New Look version its a steal at £25 and is a really comfortable fit and doesn't overly crease also you can roll the sleeves up for a relaxed look - go get it before it sells out! As some of you may be happy to pay for the Levis version as we all know if you buy Levis you'll have it for life, i've listed it alongside all products i'm wearing at the bottom of this post. Last but not least the bag, so firstly for me if your shoes have red lobster on them you need to add red somewhere else in your outfit. I didn't want this look to be too crazy I wanted to show you guys how you can wear novelty shoes everyday with your summer wardrobes. So I pulled out a trusty old favourite of mine, my Russel & Bromley "chanel-esk" chain bag. For me Russel & Bromley has the same quality as many high end brands, they offer style and quality and the trust that the brand is here to stay. My mum introduced me to the brand and even brought me this style i'm wearing. I've used it on many evening occasions but thought id try it with one of the handles tucked in to create a more cropped cross body look. As the bag I have in this shoot is a few years old and now not sold at R&B i've found a similar version for you all so you can get this look below.